Take the overnight ferry from Portsmouth to St. Malo and be at Maison Maurice the next day in around four hours - with virtually no motorway tolls! Alternatively cross from Dover to Calais or Boulogne, the drive will be about 7 hours or more depending on your speed and the number of stops you like to make. Travel to Angouleme via Lille on the Eurostar and TGV (bookable as one journey with Rail Europe - good discounts when booked at least four weeks in advance). Car hire is available at the station and we are an hour's drive away. We’ll email you directions if you need them. (Please note - we don’t recommend you go via Paris unless you speak French and/or know your way around the City). La Rochelle airport (Ryan Air, Flybe and Airlinair – sometimes Air Lingus and Jet2.com). We are about an hour’s drive from both and car hire is available - check Sunday availability before booking to La Rochelle. Leave the A10 at junction 36 PONS. Follow the D732 direction Pons, continue along this road (including passing under a road bridge and past a roundabout with pilgrim statues) until you reach a large roundabout signposted JONZAC D142 to the right (the other turnings being Cognac straight ahead and Pons to the left). Take the D142 direction Jonzac and continue along this road for about 3 or 4 minutes. You will pass Avy (a small hamlet on your right) and almost immediately after this you will see a sign on the left BIRON D144. Take this road and follow for approximately 1 mile. When the road bears right take the turning on the left (small signposts Rejolles and Rue de la Brande). Then almost immediately take the first right Rue de la Croix. Follow the road round and Maison Maurice (number 11) is on the left. Continue round the road to the back of the house for parking and enter by the green door. Maison Maurice has won numerous awards since we opened our doors. 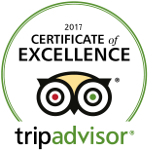 We're proud to display our Tripadvisor certificate of excellence for 2017 amongst others. We have four rooms available all year round: Rouge, Blanc, Rose and Fizz. For full details click here. Please enter your details and click send.